Realistic Games is a slots developer of whom you may be aware and they have a list of high quality slots as part of their catalogue of which Randall’s Riches is one. There’s a very small genre of online slot whose theme is mining and this game is a valuable addition to that number. With five reels and ten paylines, Randall’s Riches is a simple-looking slot with some interesting bonus features and cartoon-style graphics; our miner is a prospector and all the symbols are the accessories and tools of such a person. There’s a tin of beans, a shaving set, a lantern, a horseshoe and a pistol; characters include the miner, a snake and a pit pony. 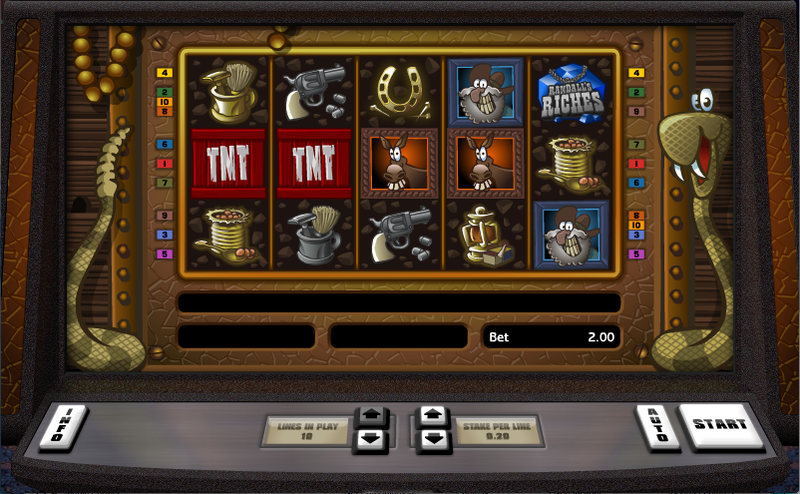 A TNT symbol triggers the bonus game, the wild symbol is the Randall’s Riches logo and there’s a pick axe scatter symbol which can make winning combinations without being on an active payline and also trigger the Pick Axe bonus. That’s the longest title for a bonus round we’ve come across so far but it’s quite a length game; you’ll need to land three of the TNT symbols on an active payline and then you’ll need to select one of those symbols to reveal the number of picks you’ll receive in the next part. You’ll now be placed in front of a cave with five wooden weapons lined up in front of you and you must pick the number you received in the previous round. Each will fire something destructive at the cave and dislodge a cash prize. You can see this in the video below. This is small but welcome bonus game and if you land three or more of the pick axe scatter symbols anywhere on the reels you get to pick one of those symbols; a rock will crack open and reveal a prize. The more scatters you landed, the bigger the prize. Each of the basic symbols (beans, horseshoe, pistol, lantern, shaving set) also has a gold version; if you can include 1, 2, 3, 4 or 5 of these in a winning payline it will multiply the win by 2x, 3x, 4x, 5x and 10x. This is a neat and compact game which clips along nicely with an appropriate prospecting soundtrack; three bonus features add to the fun on a slot which is well worth recommending.